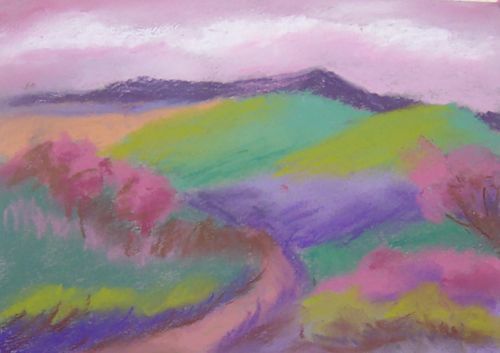 Most of the artists have mentioned that they found themselves reaching for the same pastels for the same area in many of the pastels they did. The idea really is to try everything, even if you don’t like the result, you now what those colors look like together….some were surprised at what they tried and liked. So, I purposely went as far away from the original as I could get. Ah, success…..it’s so bad, it’s almost hypnotic! But, once again, it was definitely FUN! 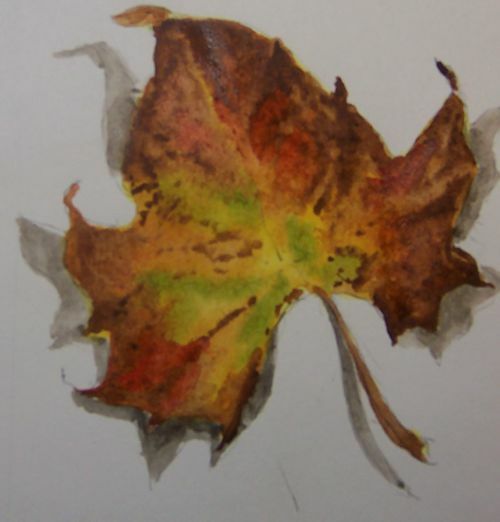 This is a quick watercolor done this evening of a leaf collected while walking my dogs. Fall in L.A. is a strange affair. Hot temps and very few beautiful leaves. Most trees just go from green to brown and drop leaves when the wind blows. 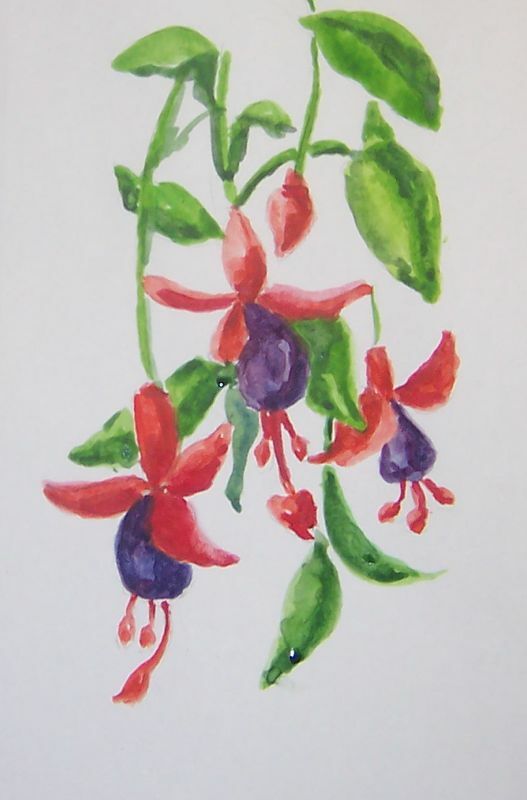 The image is 4 X 4 done with Winsor & Newton watercolors in my sketch book. Not really watercolor paper, but works ok.
I’ve decided to bite off probably more than I can chew, but I’m going to try. 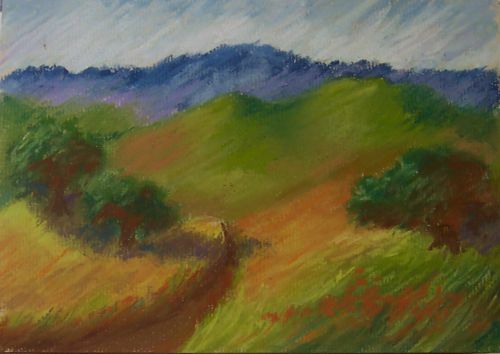 There is a movement going around in the art world about a comment that has been attributed to several people over the years, so who knows….that to really know a medium, one needs to complete 100 paintings in that medium. 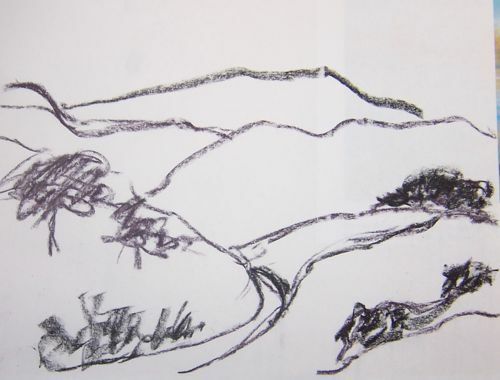 In last month’s issue of the Pastel Journal, artist, Maria Bagetta, wrote an article about her having achieved that goal. In order to make this workable, Maria confined her paper size to 10 X 10 and decided to restrict herself to 30 minutes on each painting. The photo of the 100 paintings is amazing! 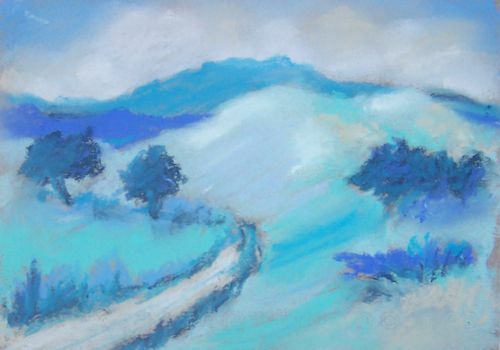 Debrah Secor, a pastel artist and teacher in Albuquerque, N.M. challenged readers of the website, Wet Canvas, to do the same thing. She opened up the challenge to any medium, not just pastel, and each person could choose the size of painting and time limitation. She had a great response in October that has rolled over to November. There’s one member that has completed something like 70 so far and is expecting to complete the 100 this month. So………….I decided to pick up the challange (there is no time limitation, of course and many may not finish, but so far they are having a great time of it. 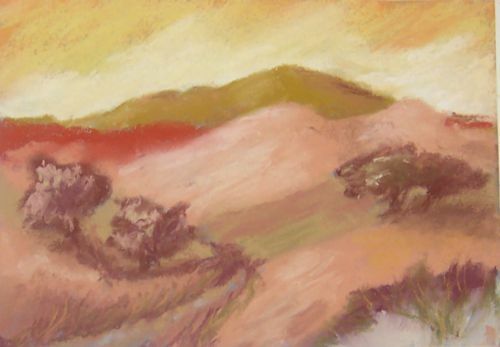 I will work in pastel, 5 X 7 size and 30 minute time limitation. The following illustration is called a Notan. A Japanese word for simplified drawing of the values (dark, medium & light) of the proposed painting. Unfortunately, I skipped the medium value, but you’ll get the idea. That’s as far as I got today. Let me know if anyone in Vegas makes book on my finishing! 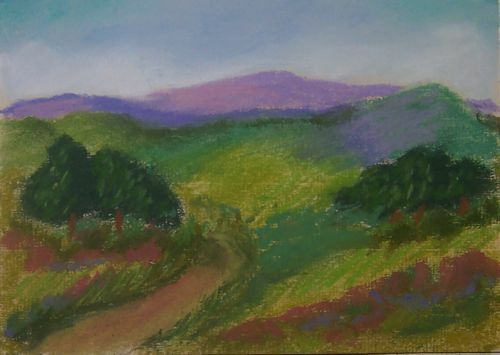 Above is a pastel that I rushed to finish after the Lakewood Art Show and before Halloween (which is a big deal at my house)! This was done as an entry into the First Annual Fall Painting Competition on Facebook. The had nearly 1000 entries! The paintings had to be started and completed in the month of October. 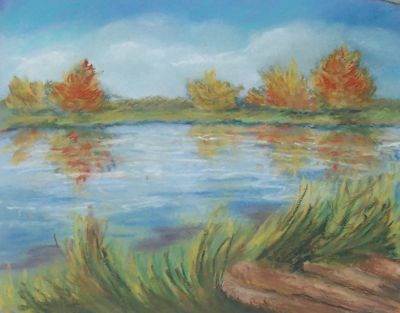 They have several categories similar to all competitions: oil, acrylic, pastel and watercolor. They will be announcing the winners they hope by mid-November. I’m not sure they knew what they had gotten into, but by the end of the month they were saying how amazed they were at the number of entrants. Each person was allowed to enter up to 3 paintings, but I was lucky just to complete one. Maybe next year? If any of you are Facebook users you can look at all the entries by going into the Events forum from the main page and clicking on the Fall Painting Competition….you know, now I’m not sure that it isn’t titled Autumn instead of Fall….but, in any case, once there you see a section of photos and the words “see all”. Click on that and you get the screen filled with thumbnails. Clicking on any of them will enlarge the image and there are arrows for moving forward. If you enjoy looking at art, you’ll be very impressed with this collection. Most of them are just stunning.